National Journal of Maxillofacial Surgery (ISSN: Print - 0975-5950) is peer-reviewed journal. 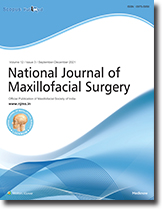 The Journal is Official Publication of Maxillofacial Society of India. The journal publishes articles on the subject of maxillofacial surgery, oral surgery, plastic surgery, radiology, pathology and related subjects. The Journal is published in January and July. Table of Contents (TOC) email alerts: Receive an email alert containing the TOC when a new complete issue of the journal is made available online. To register for TOC alerts go to www.njms.in/signup.asp. Really Simple Syndication (RSS) helps you to get alerts on new publication right on your desktop without going to the journal’s website. You need a software (e.g. RSSReader, Feed Demon, FeedReader, My Yahoo!, NewsGator and NewzCrawler) to get advantage of this tool. RSS feeds can also be read through FireFox or Microsoft Outlook 2007. Once any of these small (and mostly free) software is installed, add www.njms.in/rssfeed.asp as one of the feeds.